• Two models to choose from! • Adjustable to 16-24" or 24-32"
What sizes platforms are available? 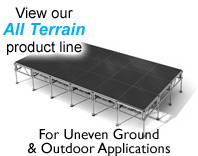 IntelliStage platforms are available in 3'x3' and 4'x4' in the US. IntelliStage platforms are available in 1x1 Mtr and 2x1 Mtr internationally. Steps, triangles and quarter round platforms are also available. 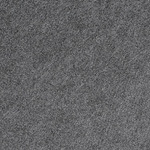 Platforms are available in a grey carpet finish, black textured industrial finish or rugged black Tuffcoat finish. How much weight can an IntelliStage platform support? IntelliStage platforms are capable of supporting 757 kg. / 1 sq. m. and 157 lbs. 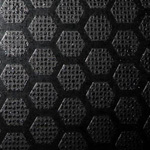 / 1 sq. ft. (Expo certificate for 757 kg / 1 sq. m). 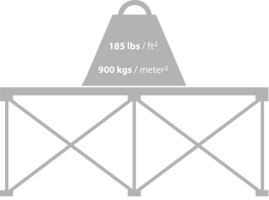 The total weight load a platform can support ultimately depends on the platforms overall size. 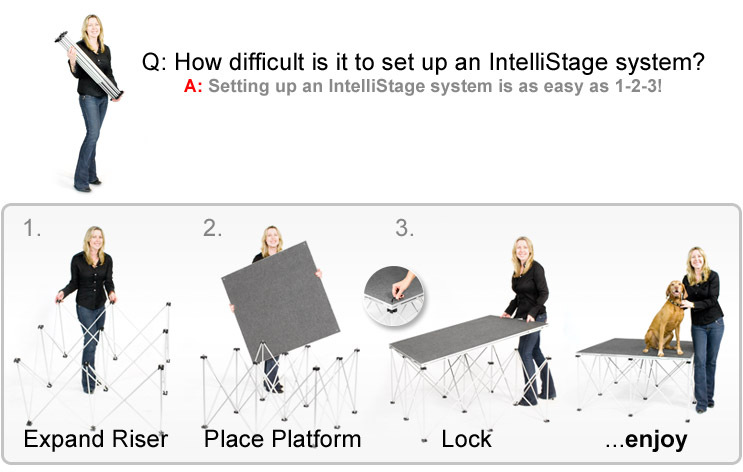 How tall are IntelliStage risers and what is the maximum safe stage height setup? 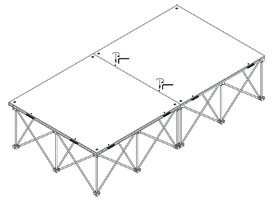 IntelliStage risers are offered in 8", 16", 24" and 32" for US systems. 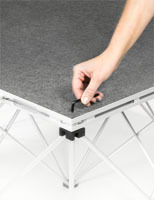 IntelliStage risers are offered in 20cm, 30cm, 40cm, 60cm and 80cm internationally. 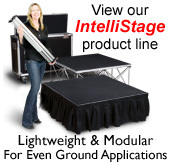 IntelliStage risers can be double stacked to increase the stage height through the use of our ISREK hardware. The max height that an IntelliStage system can be setup is 64" in the US and 160cm internationally. Riser heights are not adjustable, however, risers are interchangeable meaning a single platform could be placed on either an 8" riser or a 32" riser. Risers can also be stacked on top of each other to increase their height (up to two risers) through the use of ISREK hardware. Will steps be required for my stage configuration and is any additional hardware required? We recommend the use of steps on stages taller than 8" or 20cm. Each steps also requires 1 package of ISSJ hardware to properly secure it to its adjoining step or stage. 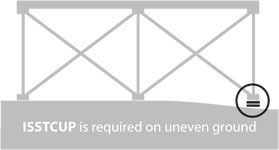 Can an IntelliStage system be setup on uneven ground? We recommend that IntelliStage systems be set up on level flat ground. We do not recommend setting up IntelliStage systems on grass, dirt or ground with varying surface levels. If slight variations in floor height occur we recommend the use of our ISSTCUP stacking cup designed to help level the stage surface and ensure that all risers feet are in firm contact with the ground. How are platforms locked or secured together? Each IntelliStage platform has an integrated locking mechanism that secures all platforms together. The mechanism is operated through the use of an allen wrench hex key that is provided with each platform. For storage the hex key stores away into the aluminum stage profile. How are platforms locked or secured to risers? 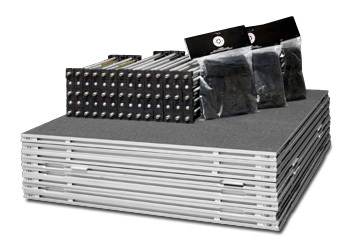 IntelliStage platforms lock to risers at platform corners through the use of an allen wrench hex key that is provided with each platform. How much room does an IntelliStage system take up when stored? In most cases an IntelliStage System never takes up a larger footprint than a single platform. All components can be stacked and stored neatly for minimal storage space required. We wish you and yours a wonderful Holiday Season!